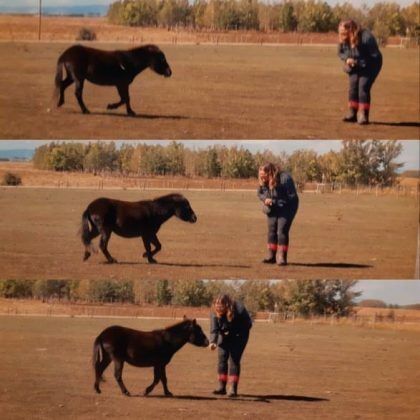 Kendra Gale of Miniature Horsemanship graciously wrote this blog post for us, sharing how she uses Positive Reinforcement to “re-program” a hard to catch horse. Something I have noticed about Positive Reinforcement with my own ponies is how positive we all feel after a session, pun intended! Our horses and ponies are amazing learners and when things are presented in a positive way they just soak it up and are eager for more at the next session. There is just nothing like having all your ponies meet you at the gate whenever they see you coming! To understand why positive reinforcement is so powerful, and to use it most effectively, it’s important have a basic understanding of learning theory. Learning theory is a scientific principle of how learning takes place. Learning is a result of either reinforcing the desired behaviour or punishing an undesired behaviour. 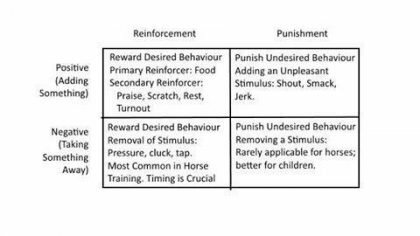 Both reinforcement and punishment can be positive or negative. In this context, positive and negative don’t mean good and bad. Instead, think of them mathematically: positive means adding something, and negative means taking something away. Most traditional horsemanship falls into the category of negative reinforcement. Once again, negative doesn’t mean bad, but instead taking something away. Using an aversive stimulus and then removing it when the desired response is achieved = traditional pressure and release training. An aversive stimulus doesn’t necessarily mean it’s painful or scary (though it can be), it simply means something they’d rather would stop – could be pressure on a halter, a sound or even your body position. If you are trying to catch a horse using negative reinforcement, then it’s important to use the smallest aversive possible, and have extremely good timing on the release. That might mean walking towards them and stopping the second that even their ear moves away from you, and backing off to reinforce them not moving, and building up gradually until you are close enough to halter them. But what if we used positive reinforcement instead? Positive reinforcement means that instead of removing an aversive stimulus to reinforce a behaviour, we’re going to add something that they value. There are many things that horses value that can be used as positive reinforcement – scratches and rubs, returning to friends, a favourite activity – but the most valuable is going to be food. Food is a primary reinforcer for horses, which means it’s something that they need to survive and that makes it a very powerful and effective reward. 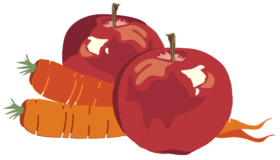 A critical component of effective use of positive reinforcement – one that will eliminate a lot of the concerns about biting or bribery – is the bridge or marker signal. It’s a cue that you use to mark the exact moment the horse earned a treat, and bridge the gap until they get their reward. Using a bridge signal allows you to be precise in your communication with your horse, and say YES, that’s the moment you did exactly what I wanted. It eliminates confusion and the horse thinking that reaching towards you is what earned the treat, which is exactly what we don’t want to teach them. A bridge signal can be anything that works for you. Many people use a clicker, as it’s a unique sound and very precise. Others use a click sound made with their tongue. And a verbal bridge is very effective as well, as long as it is consistent, especially in the early stages. Choose a single word, and say it with the same inflection each time. GOOD or YES are common options. If you’re trying to catch a very fearful horse, you might start by bridging and rewarding them for simply looking towards you. You might even have to roll the treat in their direction, or put it in a tub and let them come get it that way. But even those small efforts will be both teaching them the line of communication (bridge signal = reward) as well as beginning to associate you with good things instead of scary things. Another tool we can use to great effectiveness with positive reinforcement is a target. Teaching our horse to touch a target with their nose is a skill that we can use to help build many behaviours, and catching is a great one. A target can be anything – I have a rainbow coloured crop I often use, but a duster, a piece of pool noodle on a stick – anything that you can hold easily in your hand and has an obvious spot for them to touch will work well to teach them the skill. It’s very easy to teach a horse to touch a target, as they are naturally curious and explore new things by touching them with their nose. Hold out the target, say “target” or “touch” (or whatever you prefer) and use your bridge signal the moment that their nose touches it, then reward. It won’t take many repetitions before they’ll be keen to come find the target, as it’s a simple and very fun game that continues to solidify their understanding of the bridge signal and earns them a reward. If I go out into the pasture with my horses who have been target trained and ask them to “come touch” they’ll come a-running no matter how big the space or green the grass. If you have a horse that is leery of the halter itself, once they understand the target you can then start asking them to target the halter instead, then target putting their nose through the halter, and continue to bridge and reward until they are happy to stand quietly and be haltered. Positive Reinforcement = an eager learner! While it sounds like a lot of steps, once you get started with positive reinforcement you’ll be amazed at how quickly your horse learns, and how valuable it is to have the ability to tell them YES, that was the moment you got the right answer, or YES you’re on the right track, try it again. 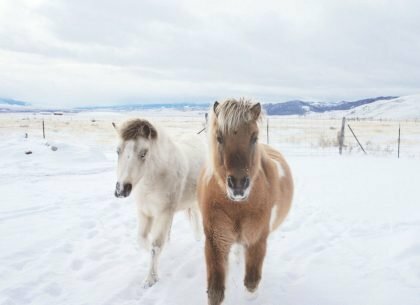 Using positive reinforcement to teach your horse that being caught is a fun and easy way to get started and learn the techniques, but the sky is the limit to the skills you can teach or improve by incorporating positive reinforcement. Which Harness is Best for My Pony?